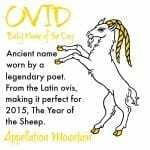 This name comes to us from Ancient Greece by way of Australia. 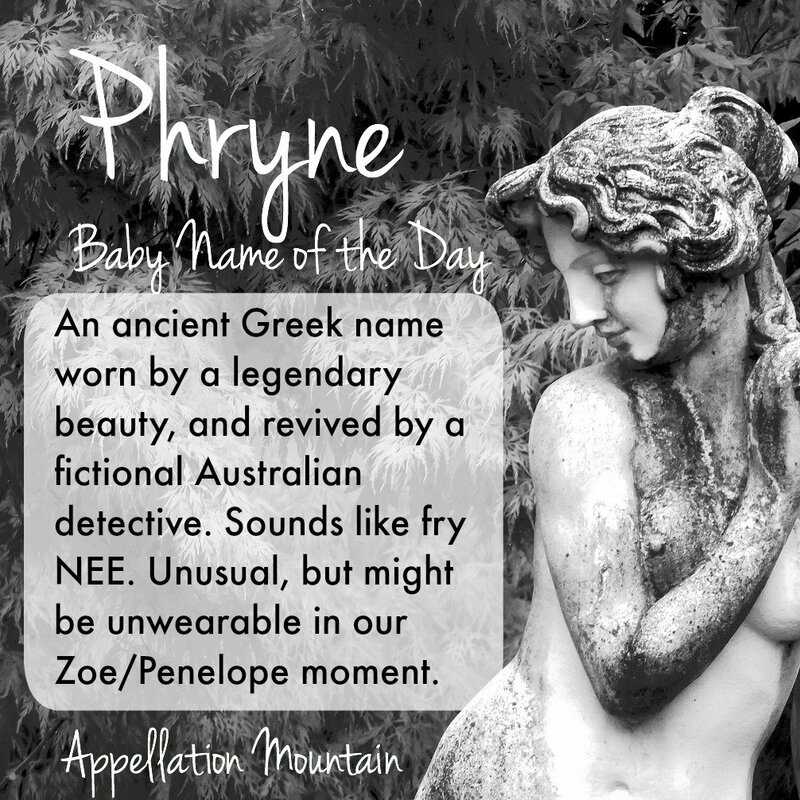 Thanks to several for suggesting Phryne as our Baby Name of the Day. The first time I saw Phryne, I thought it was an oddball respelling of nature name Fern. Phryne is pronounced fry NEE. It’s an Ancient Greek name, a cousin to Chloe and Penelope. 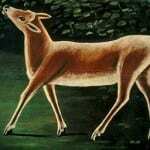 And yet, the two names do have a few things in common: they’re both nature names, and they’re both associated with the earlier years of the twentieth century. Fern was most popular in the 1910s and 20s, when a certain Miss Fisher was getting her start. Australian writer Kerry Greenwood created the Honourable Phryne Fisher for a 1989 novel, Cocaine Blues. Her Miss Fisher leads quite the fascinating life. Phryne’s father was a distant relation of an English lord, but the Fisher family lived in modest circumstances in Melbourne. Then all of the male heirs died during the first World War, and suddenly, Mr. Fisher inherited the family title and fortune. The stories begin in 1928, when 28 year old Miss Fisher has just returned to her native Australia. She’s tremendously stylish, good with a gun, and, unlike many women of her era, can fly a plane, drive a car, and hold her liquor. She has a loyal maid called Dot, a disapproving Aunt Prudence, and a host of other helpers and friends. We later learn that Miss Fisher served as a nurse in France during the war – which reminds me of another rags-to-riches female detective from the same era, though one considerably less flamboyant, Maisie Dobbs. So where did the fabulous Miss Fisher get her unusual name? From a courtesan in the fourth century BC, of course. Phryne was a nickname. It means toad. That doesn’t sound terribly flattering, but apparently she wasn’t the only courtesan given the nickname. It referred to her skin tone. Legend has it that she was a great beauty, and that at least one sculpture of Aphrodite was based on her image, while another statue of Phryne herself stood in the temple of Delphi. We do know that Phryne stood trial for impiety, though it isn’t certain exactly what that means. She was acquitted of the crime. Some accounts say that she disrobed in the courtroom, and her beauty moved the jurors to find her innocent. It’s a scene often depicted in art. Speaking of art, Phryne was a favorite subject over the centuries. 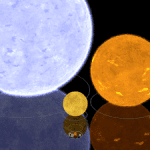 There was also an 1893 opera by Camille Saint-Saens, plenty of references to her in literature, and even an asteroid named in her honor, discovered back in 1933. But are there any real women named Phryne? Miss Fisher is a larger-than-life character. Her fictional sister is named Jane, so I’m not certain how her parents landed on such a distinctive name for one of their daughters. The books are now a television series made by the Australian Broadcasting Corporation. (And currently on Netflix. Ask me how I know!) The lovely Essie Davis plays the title role. So it wouldn’t be a surprise to run into others who are familiar with Phryne. While the 1940 US Census turns up a handful of women by the name, this one is rare, rare, rare. Phyrne has never been given to as many as five girls in a single year – meaning that the name is effectively unlisted by the US Social Security Administration. Perhaps Phryne would fare better in Australia, where the success of the books and the television series might make this one more familiar. 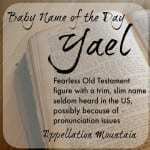 Overall, though, it’s a fascinating name, and one that deserves to be better known. What do you think of Phryne? Is it wearable? I am a fan of the TV series too, and we have also just named our kitten Phryne . Wouldn’t name my child this though, despite the fact that I would have liked to call my daughter the welsh Myfanwy (my husband couldn’t cope). It’s FRY- nee. Listen to the audiobooks or watch the show. The emphasis is definitely on the first syllable. This is my kitten’s name. So far she’s gotten: Frin, Prim, and Pryknee. If you name your kid this be prepared for a lifetime of mispronunciation. My cat doesn’t care, and Small Phry is a ridiculously-cute nickname for a kitten. Yes We have called our new cat phyrne nice to know her name means toad or wizard. Very ethereal, earth bound. 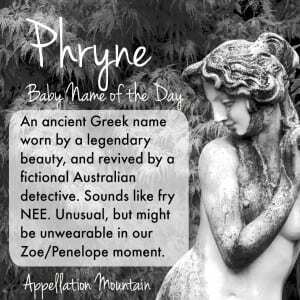 as much as I love the name and the series, I could not name my child Phryne, as my last name is Fry. I understand, but what a beautifully alternate name! I’m from near Toronto, Ontario Canada, by the way. 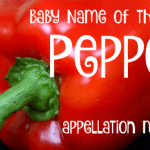 I have bookmarked Appellation Mountain to assist me with character names for short stories and novels. Interesting name….. interesting history. Any name worn with panache by likable character may become acceptable and even popular. Any name can be the object of ridicule especially in the school yard. I’m not too fond of the name because of the courtesan connection, had it been a tad bit more favorable background, I’d consider it, but I feel the same way with Aphrodite. I do not mind the pronunciation, many Greek names are like this and Greek isn’t common in the states, so I could see how it is off putting. It is similar to Hippolyta, while I’ve ran into people who have Hippolyta as their name, American’s remind them that their name has hippos in it and that’s just weird! It would take parents who can look past those low remarks and appreciate it history and its alluring aspects. I would be ecstatic to meet a little Phryne. I’m a Miss Fisher fan, and I’m fond of obscure Ione/Cleome/Xanthe/Ianthe as well as more popular Zoe/Phoebe/Penelope, so I am favourably disposed. And Phryne’s historic backstory gives it some edge to pair nicely with Lilith or Morgan… a bit bad girl…? The books do address the Jane/Phryne thing, in that Phryne was supposed to be the much less salacious and more New Testament Phoebe, but her father free-associated all over the birth certificate in a inebriated haze. Oops! Josie, thanks! I haven’t read the books – good to know there’s a reason. At one point in the series, they say that he mis-recorded Jane’s birthday in the same fashion. fry-NEE – probably the only way I could remember this would be to think “fry me” – so, no – just a bit too esoteric for me. But love the write-up!